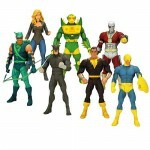 For those DCU fans looking for Wave 9 and 10, they are STILL shipping. Wave 10 has barely shipped. Tons more are on the way throughout the holiday season! I tried looking for these on walmart.com no dice. what state are you guys in? I am florida trying to find out long it will take to see them. There's a beast boy and forager listed on ebay (that was all I found on there from the wave). Location shows NJ. Theres a robotman up now also. I wonder if there was a bunch of these on the shelf when this guy bought them. I will check in Plano, Texas today. I have just gotten on this DC Universe kick. Mostly the Batmans. Awesome toys! Nothing in NW Indiana for sure. I am hoping Mattel and Wal - Mart stick to their word and these are more abundant than wave 5. It was Southern OHIO to be exact. Not NE Ohio for sure. We don't even have wave 8 yet, let alone 9 or 10. Someone let me know if they get their hands on a Power-Girl. D*** the rest. Production on Wave 9, I hear, was cut to only 25% of DC Directs usual production numbers so while you will still be able to find it most characters in that line are way up in value. Cheapest I've seen Green Arrow is $30. Anyone in Southern California find any please let me know, I'm hoping to get a set before the hoarders get to them. Was it southeastern Ohio? Because I'm pretty sure SW Ohio hasn't had any new ones since wave 6 or 7. The reason I'm pretty sure is I've been hunting for a Gentleman Ghost since it first hit retail and I haven't seen him or his wave-mates yet. I pounded the pavement for wave 10 yesterday called and went to at least 20 Wal - Mart stores in NW Indiana and litlle bit in Illinois and notihng. I am hoping that some of them start turn up in the next couple of days since OH got them a few days ago. Also, I think would be nice if they treated wave 10 like their other exclusives either with an aisle end cap or 4 sided floor shelf. If anyone out there sees these figures in my area NW Indiana. Please be sure to post an alert and I will do the same. I checked 5 Wal-Marts in California today with absolutely no luck. Went to Rancho Cucamonga, Upland, Glendora, Covina, and Chino. 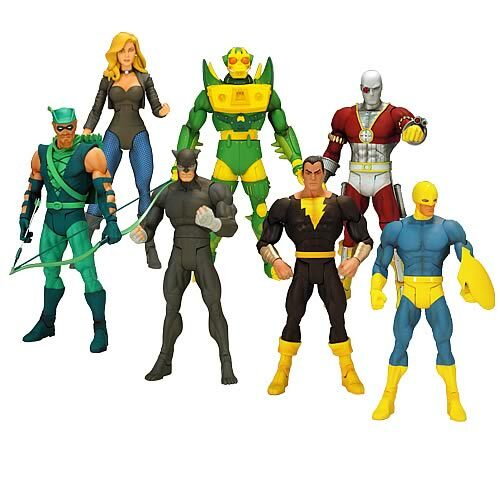 All of them except for Glendora had really low stock on DC Universe, like less than 5 figures, most were Captain Cold and/or Cyborg. Huh. That's about 45 minutes south of me and they're still not here. I'm not sure what the retail stores in my area are waiting on, since there's plenty of room on the pegs for more DCUC figures now. Poster from Fwoosh found them from around Cinci. This is getting nerve racking. I went to 2 locations that are open 24 hours while they unloading their trucks. 1 case of wave 6 turned up that is it. Beast Boy turns into ZOAR FTW!! !